Greatly enjoy working with Helen and her team at Saber! Give your business an impressive and impactful display during trade shows and events with custom tablecovers that speak your brand message. 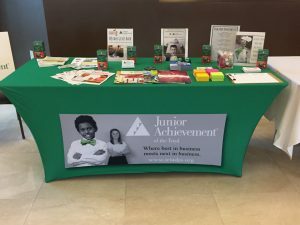 Affordable, attractive, and highly customizable, custom tablecloths do a great job in promoting brand awareness and are must-haves for tradeshow booths, event kiosks, demo tables, etc. Here at Saber Sign Solutions, we are all about helping our clients’ businesses get noticed by their target market. This is why each table cover that we produce is uniquely designed and created to fit the client’s brand, purpose, and budget. For clients who have a defined concept and design, Saber Sign Solutions has the equipment to print those on the desired table-cover material. For clients who don’t have designs yet, we also have in-house graphic designers who can help you choose the best design and best material for the job. Our table throws and table covers come in wide selections of lengths, heights, shapes, cuts, colors, materials, and designs, so Saber Sign Solutions can deliver the perfect high-quality table cover for you. Call Saber Sign Solutions at (512) 861-2699 for your free consultation with a Trade Show Display Specialist! Saber Sign Solutions understands how important it is to get the brand appeal right. This includes having the exact font type, exact color palette, and exact material…and sometimes a single table cloth can’t cover all these bases. This is why we at Saber Sign Solutions give our clients the freedom to choose from our many options in order to come up with the tablecover that clearly reflects what their business is all about. We’ve got covers that fit rectangular, square, and even round tables. They fit tables of various lengths, widths, and heights. They can be form-fitting and stretchy, fitted, drapeable, or small table runners. They can have a single solid color, or have a minimalist print on the front, or have a patterned design all over. They can be made out of your desired material such as polyester, cotton, PVC, vinyl, and nylon. 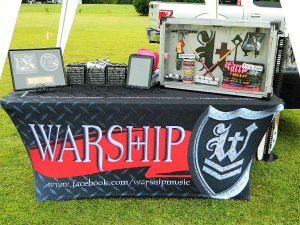 So if you’re looking for a custom tablecover that conveys your brand message, Saber Sign Solutions is the provider for you. The cost of an advertising tool is definitely something that business owners look out for, and Saber Sign Solutions totally gets that. Every business owner wants the best service offered at the most reasonable price…and that’s exactly what we have. 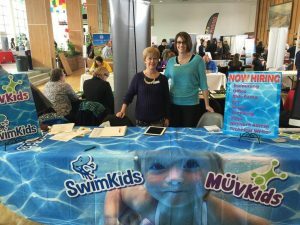 Custom tablecovers by Saber Sign Solutions are not only affordable, they are also reusable. Made of highly durable materials, our products are built to last. During events and tradeshows, you don’t have to spend so much on getting a new table because a stunning tablecloth can easily cover up the flaws. Purchasing a quality custom tablecloth for your business is a worthwhile investment. For a reasonable price, you can get your business noticed and remembered. If you want your custom tablecloth last a long time, you need to take good care of them. The good news with table throws by Saber Sign Solutions is that taking good care of them is won’t be a big hassle. Our fabric tableclovers are both hand-washable and machine-washable in cold water. They can be placed in the dryer on low, or can be hung to dry. They can also be steamed or ironed in low heat to remove wrinkles. Saber Sign Solutions has many more tablecover care tips for many other tablecover types. We’d be happy to share them with you. Drop by our office and schedule an appointment with us to discuss how our company can help you out with your promotional and marketing needs. Saber Sign Solutions has been a local signage provider for quite some time and we’re confident of the service that we provide…our many happy clients can attest to that. The best thing about partnering with a full-service sign company is that we don’t just deliver signs and banners and tablecovers to you. We share with you our knowledge, expertise, and years of experience throughout the entire sign-making process. From studying your business and your goals, to selecting which tablecover type works best for you, to coming up with the most effective design, to professional production and printing, and even until maintenance, we got your back! 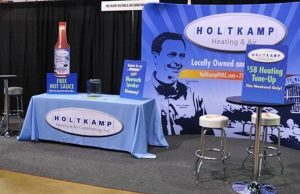 Tablecovers can do so much for your branding, especially in trade shows, events, demos, etc. If you’re curious about getting your business a professional quality, durable, and affordable tablecovers but you’re not sure how to go about it, Saber Sign Solutions is here for you. 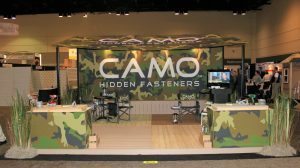 Call Saber Sign Solutions today at (512) 861-2699 for your Free Consultation with a Trade Show Design Specialist! Done in a very timely manner. I'm a customer for life. Thank you Saber Sign Solutions!